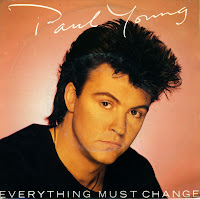 Another single taken from his 1984 album 'The secret of association', 'Everything must change' is for all intents and purposes a 'black' soul song. It's one of the few hits by Paul Young which he himself co-wrote (Most of his hits are cover versions). The single peaked at number 9 in the UK singles chart and number 25 in the Dutch Top 40.